Our plan was to make it up to Monterey with plenty of time to relax before grabbing dinner at a local restaurant. We would rest up and then go the next day to see downtown Monterey, spending the day there and having dinner at the wharf. On our final day, we would head to Carmel-by-the-Sea on our way back south to LA. It was to be a relatively brief trip, but would be a good chance for a little family bonding on the road. The MDX was loaded by 9:30 and we departed promptly when everyone was on board. Traffic, despite it being a holiday weekend, was light and we managed to pass the usual areas of congestion on the 405 without incident. In planning the route, we opted to take I-5 instead of the more scenic Pacific Coast Highway because we figured that the more direct route would allow us to get there a bit earlier. It also presented us the opportunity to stop in Paso Robles, one of the premier wine towns in Central California, for a bit of lunch when we crossed back over to pick up the 101. Pushing north in the mid afternoon, we quickly found ourselves in Salinas where we turned off onto the Monterey Salinas Highway to go right past the famed Laguna Seca race track. West Brother and I promptly vowed to return one day when we were not in a fully laden SUV. We pulled into the hotel before 4PM and got checked in and settled in our rooms to relax for a few hours before heading out to dinner in nearby Pacific Grove. This quaint town with basically a single main street surrounded by residential homes is pretty much what one imagines when conjuring up images of a picturesque Northern California town. Lined with small shops that close by the late afternoon and only a small handful of highly rated restaurants, we strolled the entire street within a matter of tens of minutes and grabbed our dinner earlier than expected, giving us a chance to relax for the evening and enjoy our surroundings. The next morning, we piled into the car and headed out to 17-Mile Drive. A lot had changed since the last time we were out here. For one, there is now a toll booth set up at the entrances to the ocean access section of the drive and motorcycles are banned (boo!!). It has also seen continued development as the number of homes has increased dramatically in the last two decades. 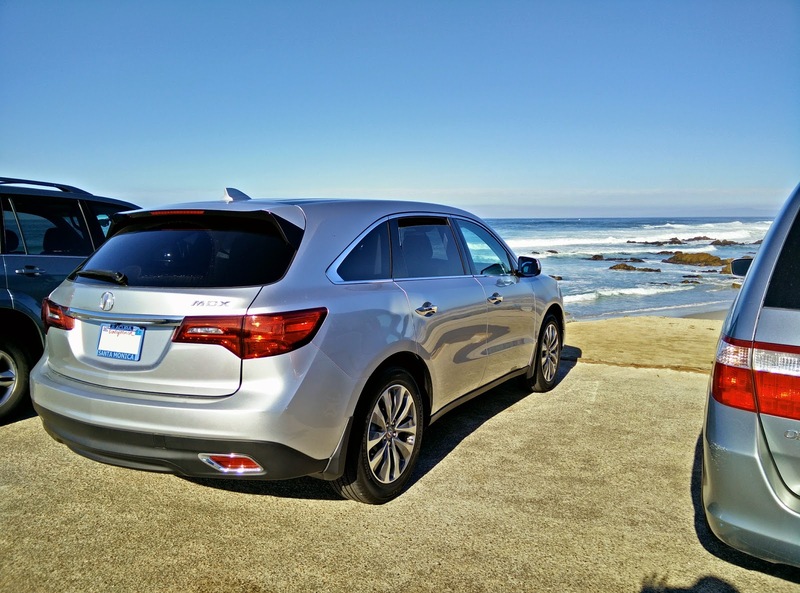 We cruised along in the MDX, taking full advantage of the large windows and great visibility to enjoy the scenery, stopping at several points to take photos and enjoy the gorgeous weather. The strong winds were churning the water and sending waves crashing up along the coast, making for spectacular scenery. About half-way into our drive, we approached the famed Pebble Beach County Club where we paused to revisit a photo that we had taken at some point during that last trip over two decades ago. As much as some things had changed, some things continue to remain the same. Despite it being right about lunchtime, only a handful of people were scattered around the well manicured grounds. Shockingly, almost nobody was actually golfing. The little gift shop/cafe where the original photo was taken looked largely unchanged on the outside, allowing us to recreate a similar photo to the one taken two decades ago. We also took the chance to snag a bottle of local wine to enjoy back at the hotel. After finishing the remainder of the drive and stopping in Pacific Grove for lunch, we spent the afternoon at the Monterey Bay Aquarium, enjoying the company of about every possible form of marine life imaginable. On display at the time were what felt like every possible variety of jellyfish in the Pacific Ocean along with a large number of very hungry penguins and a couple of shy octopi. We also got a chance to watch a few playful otters splash around in their habitat before chasing each other around for a few handfuls of shellfish that were a part of their hourly feeding. The Aquarium is one of those places that I could spend an entire day at just watching the animals at play and imagining what life would be like as one of them. With the setting sun casting brilliant hues of pink into the sky, we departed the Aquarium and walked around the world famous Cannery Row. Once a truly industrial section of the city, it has long since become a major tourist trap that focuses on selling overpriced seafood and chotchkies made on the other side of the Pacific Ocean in China. Still, there is a distinct charm to the architecture and I have always wondered just what it would be like to see this place ages ago when it was genuinely still filled with active canneries, churning out millions of pounds of canned food products to be shipped all over the country. Our final morning in the area was spent in the tiny town of Carmel-by-the-Sea, a lovely little hamlet nestled against the Pacific Ocean and filled with adorable local shops selling everything from art to furniture to jewelry. A gentle rain had been falling all morning and we found ourselves ducking into stores just to avoid getting drenched by the worst of it, but the sporadic rains were a welcome sight for the drought stricken region. Despite the damp weather, we were able to explore a number of intriguing shops, including one that was just jammed packed with toys from my childhood. Before setting out for home, we grabbed a bite to eat and then started our long drive home, retracing a similar route we had taken a couple of days ago. We reflected on the lovely time we had and my wife and I joked about how nice it would be to own a home up there. Of course, this is all purely in jest as the housing prices on the Monterey Peninsula are just bordering on obscene. Still, it makes for a wonderful vacation spot and the combination of beautiful scenery, comfortable weather, and small-town charm with big city amenities means that we will likely be back again before too long. Perhaps next time, with vehicles more appropriate to tackle a few laps at Laguna Seca.